Welcome to crix11.com. In Today Dream11 Fantasy Cricket Prediction of RCB v KXIP 8th T20 Match IPL 2018 which will be played on Friday, 13th April we will cover who will win the match, playing 11, pitch report of M Chinnaswamy Stadium, Bengaluru, what astrology has to say on the toss. We will also cover players recent and past performance, weather report, the best choice for captain and vice-captain, dream11 best team, key players, where to watch the live match and details of live streaming, dream11 guru prediction, playing condition. We take these data and statistics from a very reliable source so please make sure to read the whole post so that you don’t miss any information which may lead you to win the dream11 grand league or any other fantasy leagues like Myteam11. Where Can You Watch the Live Streaming of RCB vs KXIP or Channels to Watch? Who Will Win the 8th Match of IPL 2018 Between RCB vs KXIP and Toss Prediction? Date: The match will be played on 13th April 2018 (Friday). Match: Indian Premier League, RCB vs KXIP, IPL 2018. Venue: Bangalore, M Chinnaswamy Stadium. Pitch of Banglore used to be a flat wicket before the previous session but the last session of IPL we have witnessed a wicket which leads RCB to a losing side. We have some good news for you guys, the pitch of M Chinnaswamy Stadium in IPL 2018 is expected to be a batting-friendly pitch. Today batsmen will enjoy batting in this pitch. Finger crossed guys as Most of the time it will be partly cloudy and before today’s match it will be mostly cloudy but there is no sign of rain. We can expect a full game today. The temperature is expected to be 29-Degree Celsius and humidity to be 42% which may go up to 86%. If we look at last five games they played against each other then KXIP has won 3 matches out of 5 matches whereas RCB has won 2 games out of 5 games. The last IPL session was a nightmare for RCB and they will definitely want to change that in IPL 2018. It will be interesting to see how they take on each other in today’s match. Star Sports has paid a huge amount of INR 16,347.50 Crores to get exclusive rights of IPL 2018 for live coverage for five years starting from 2018 to 2022. Star Sports has all the media rights including TV and all Digital Rights. You can watch the full match of Kings XI Punjab vs Royal Challengers Bangalore on Star Sports. Brendon McCullum, Virat Kohli (c), Tim Southee, Aniket Choudhary, Quinton de Kock (wk), Yuzvendra Chahal, AB de Villiers, Moeen Ali, Sarfaraz Khan, Navdeep Saini, Pavan Deshpande, Mandeep Singh, Pawan Negi, Chris Woakes, Colin de Grandhomme, Corey Anderson, Kulwant Khejroliya, Aniruddha Joshi, Manan Vohra, Parthiv Patel, Washington Sundar, Murugan Ashwin, Umesh Yadav, Mohammed Siraj. Yuvraj Singh, Lokesh Rahul (wk), Barinder Sran, Ben Dwarshuis, Ravichandran Ashwin (c), Chris Gayle, Mujeeb Ur Rahman, Mayank Agarwal, Akshdeep Nath, Manzoor Dar, Karun Nair, Axar Patel, Mohit Sharma, Andrew Tye, Mayank Dagar, David Miller, Ankit Rajpoot, Pardeep Sahu, Aaron Finch, Marcus Stoinis, Manoj Tiwary. KXIP started their IPL session with a victory whereas RCB could not capitalize their star players. The last IPL session was a nightmare for Royal Challengers Bangalore and they will definitely want to change the scenario in this session of IPL. Aaron Finch has missed the opening game and he has joined the squad for today’s encounter. It was seen that Gayle spent some time in the nets to free his hands. Finch May get a game in place of Miller but being the second game they may stick with the same playing 11. Yuvraj Singh, KL Rahul, David Miller/Aaron Finch, Mujeeb Ur Rahma, Mayank Agarwal, Ravichandran Ashwin (c), Karun Nair, Mohit Sharma, Axar Patel, Marcus Stoinis, Andrew Tye. Although Kohli failed to register his first win, still he believes that he has the balanced side. He may think to replace Sarfraz Khan with Parthiv Patel but being the first game in their home ground it is most unlikely to happen. Our prediction is RCB will go with the same playing 11. It will be interesting to see how Kohli picks his team for today’s match as different cricket experts have different views and opinion. Quinton de Kock (wk), Washington Sundar, Yuzvendra Chahal, Virat Kohli (c), Chris Woakes, Brendon McCullum, Mandeep Singh, AB de Villiers, Kulwant Khejroliya, Sarfaraz Khan, Umesh Yadav. Lokesh Rahul: What a game KL Rahul played in the previous game. He scored 51 runs off 14 balls and contributed 42.5 points. Most of the fantasy users have taken him in their team for today’s match. If you look at the numbers 74.04% have decided to keep him in their teams. His highest score in IPL is 68 runs. Quinton de Kock: Although Quinton didn’t striked in the first game, you should know one thing playing International cricket, most of the time he scored big runs. He scored 4 runs and contributed 8.5 points. 38.53% of the users have chosen him in their dream11 fantasy teams. His highest score in IPL is 108 runs. Pro tips: If you want to play safe keep KL Rahul in your team but if you want to take a risk and play in grand league keek Quinton de Kock in your team. For multiple teams make a combination of the above players. Virat Kohli: Virat Kohli “THE RUN MACHINE” has scored 31 runs in the first match and contributed 19 points. In last 9 matches, he has scored 249 runs with an average of 27.66. 82.24% of the users have selected him. His highest score in IPL is 113 runs. Kohli has made 4 centuries in this format. AB de Villiers: Most dangerous player of cricket. He is a 360-Degree player. He has scored 44 runs in the last inning and contributed 37.5 points. His entire IPL average is 38.23 and his highest score is 133 runs. 86.88% of the users have selected him in their dream11 teams. Brendon McCullum: McCullum scored 43 runs and contributed 32.5 points in the previous match. His highest score in Indian Premier League is 158. 75.79% of the users have chosen him. Mandeep Singh: He batted at 6th down for RCB and scored 37 runs. He contributed 24.5 points. His highest score is 77. 19.25% of the users have selected him. Karun Nair: Nair batted at fourth down for KXIP and scored 50 runs. He contributed 35.5 points. His highest score is 83 runs. 57.02% of the users have taken him in their fantasy teams. Yuvraj Singh: He didn’t play an impressive inning in the first match but he has scored 100 runs in the practice game. He contributed 7 points. 33.01% of the users have taken him in their dream team. Pro tips: You can also keep Aaron Finch on your team. Try to make a combination of the above players. You can keep players from playing 11 if you play with multiple teams. Marcus Stoinis: Stoinis scored 22 runs and contributed 14 points. His highest score in IPL is 52 runs. 54.3% of the users have taken him in their teams. Chris Woakes: Woakes scored 5 runs and took 3 wickets. He contributed 34 points in the last game. 79.05% of the users have selected him in their team. Axar Patel: Patel took 1 wicket in the last inning and contributed 13 points. 35.73% of the users have chosen him. Pro tips: Try to keep Chris Woakes on your team. For multiple teams, you can make a combination of the above list of players. Yuzvendra Chahal: Chahal failed to take a wicket in the first game but his record in Bangalore, M Chinnaswamy Stadium is very impressive. In 56 innings he has taken 70 wickets. 48.59% of the users have selected him. Andrew Tye: In the last seven-inning, he took 12 wickets. His best figure in bowling is 17/5 in IPL. 24.65% of the users have chosen him. Washington Sundar: Sundar took 1 wicket in the last inning and contributed 9 points. 38.55% of the users have selected him. Umesh Yadav: Umesh took 2 wickets in the last inning and contributed 22 points. 70.75% of the users have chosen him in their dream11 fantasy teams for today’s match. Mujeeb Zadran: The youngest player in IPL history. Mujeeb took 2 wickets and contributed 28 points. Only 45.74% of the users have chosen him in their teams. Pro tips: Make a combination of the above players. Try to keep Mujeeb Zadran on your team. Pro tips: The above players are most likely to perform. Make captain and vice-captain from the above players. You can also take from the key player’s list. Pro tips: If you want you can select the above players as a captain and vice-captain. The previous season was the worst IPL season for Royal Challengers and they have started that good in the 11th edition also. Today they will play their first match on their home ground. It was indicated by few players that the pitch is of 200+. So You can understand how interesting the 8th match is going to be. If you go by crix11 prediction then RCB will win today’s match. It has been a trend in IPL that win the toss and win the match. The team winning the toss love to bowl first and this will continue in the 8th game also. Our astrology team says that RCB will win the toss and they will ask KXIP to bat first. 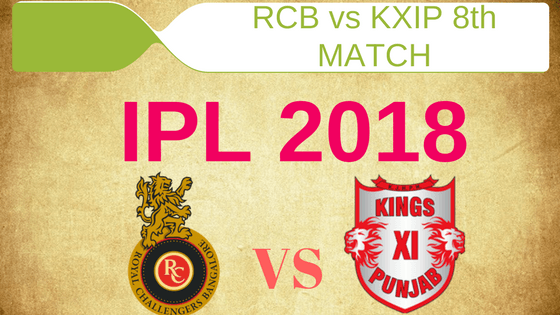 Conclusion: This is it for Today’s Dream11 Fantasy Cricket Match Prediction of KXIP vs RCB, 8th T20 Match, IPL 2018 which will be played on Thursday 13th April. You can give your valuable feedback in the comment section. Subscribe to our notification of latest updates. GOODBYE!